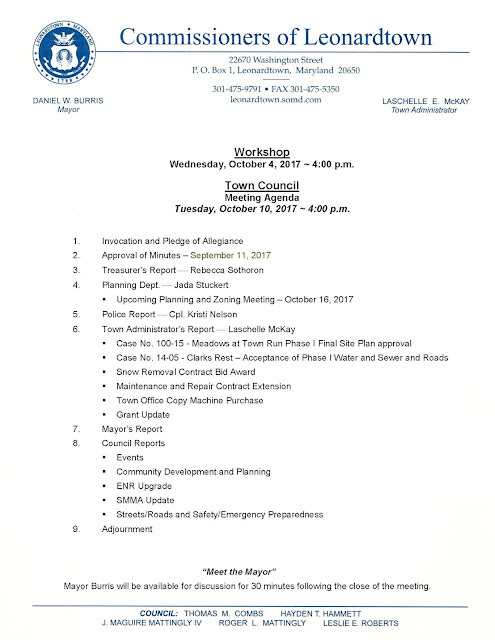 Leonardtown Maryland News: Town Council Meeting moved to Tuesday, October 10, 2017 at 4:00 p.m.
Town Council Meeting moved to Tuesday, October 10, 2017 at 4:00 p.m. In observance of Columbus Day, the Town of Leonardtown offices will be closed. The Town Council meeting has been moved to Tuesday, October 10, 2017 at 4:00 p.m. with a Workshop on Wednesday, October 4, 2017 at 4:00 p.m.